Every once in a while, a commenter writes that I should spend time on my Research rather than writing this blog. That is, the time I spend writing this blog would be better spent doing my research rather than whining about how difficult my life as a Female Science Professor is. My priorities are askew and/or I enjoy wallowing in victimhood so much that I will never be a truly successful science professor. It would be interesting to know whether the amount of time spent by these commenters reading blogs and writing comments (rather than doing their research) is at all similar to the amount of time I spend blog writing, but alas, those data are unavailable. I am unsure of the basis for the assumption that blog-writing time is directly subtracted from research time, as opposed to, say, sleeping or house-cleaning or zorbing time. Of course, we could all spend infinite time on research, and the world would be a better place if we did so [ ← sarcastic font]. I am going to assume that the time I spend with my family is an acceptable use of non-research time, but how is blog-writing time different from time spent on some other hobby or professional service activity? Do these commenters similarly criticize people who spend time gardening or playing online chess rather than spending that time doing research? Imagine if I said to a colleague “You know, Bob, that time you spend golfing really would be better spent on Research. You’ll never get into the National Academy of Sciences if you keep going off to the links every weekend for a couple of hours.” Would that be a sane thing to say? Or how about: “Pierre, how can you justify spending all that time writing poems about giant squid when you should be doing Research instead of irrelevant writing that will do nothing to get you into the Academy?”. Even if the squid poems are not so great, why shouldn't my colleague spend his time writing them? There seems to be something about FSP-type blogs that inspires the patronizing “you should be doing research” (instead of writing a blog) comments from some people. 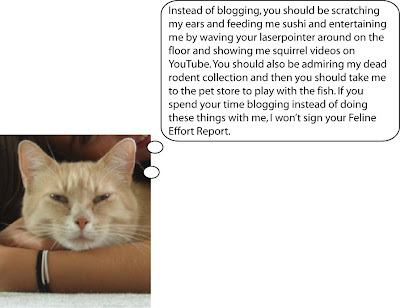 I guess I could run an experiment and blog about my cats for a few weeks (or months) and see if I still get these comments. Or I could just let the cats write the blog while I use this time to do research.. or golf (which in my case would be mini-golf, at which I excel, if I may say so myself). It's obviously an incoherent criticism. Few of the criticizers would begrudge a similar amount of time playing chess or even watching TV. But somehow blogging, especially if it touches on academic subjects, gets classified as "work time" and therefore wasted (compared to the research that could be done), and not personal time. Perhaps 25 years from now attitudes will have adjusted. I'm an anonymous lurker in the blogosphere, and I regularly read (but very rarely comment on) this blog. No, I won't even say how many blogs I read, and how much time I spend doing so. FSP, ignore these commenters. They will never make into the Academy because they cannot get NSF grants. NSF doesn't fund them because they don't have any women working in their labs or any female collaborators. If only they had diversity, they might get the funding they need to do the research and get into the Academy. Did you ever think of writing a Broadway play? I bet it would be a sellout. It's quite simple really. If 8 out of 10 of your posts were instead about how you wish you could spend more time with your family, for example, then people might suggest cutting down on some of the 10-20 hours/week you spend blogging and, well, spend them with your family instead. As it is, about 8 in 10 of your posts are spent (broadly) wallowing in gender/academic victimhood, and in particular complaining that some of your colleagues and family don't take you seriously as a scientist, etc. And indeed, you colleagues and family's perception of your worth as a scientist may well be completely inaccurate in part due to your gender. But if this is the case, and if this causes you to harbor a huge chip on your shoulder, what those commenters you refer to in your entry would suggest is cutting down on the hours spent complaining and strive instead to gain some international recognition for your work. Certainly, inventing gimmicky professorial ranks and titles seems counterproductive (at the very least) in that regard. Personally I think your blogging time should count as helping others, which most would agree is a worthy pastime. Maybe your readers don't qualify as truly needy, e.g. I am not homeless or suffering. But thanks to you and your blog, I feel more capable of navigating the treacherous landscape of academia. j.o., your idea seems to be "suffering in silence and just working harder" is the best strategy. Well, this is by not means obvious, to say the least. As to the playing around with ranks: You've got it wrong here, it's FEMINISTS who are supposed to have no sense of humor, so you are playing the wrong role here. I'm using my real name here, but I have a blog where I use a pseudonym. Some of the blogging is political, but some of it is academic or scientific, and I find that putting down my thoughts on academic and scientific matters in an organized form is beneficial. It may not directly boost my next grant proposal, but if I'm going to be thinking about these things anyway, and if these things relate indirectly to my work, well, why not blog them? Besides, if I'm really, really upset about something a colleague did (yes, Male Science Professors suffer the slings and arrows of colleagues as well) and I need to vent, venting to another colleague (who may not be as trustworthy as I think) is less safe than venting on my blog. People who are slow and inefficient readers and writers are deeply envious of those of us who can read and write extremely quickly and efficiently. They also grossly overestimate the amount of time that it takes those of us who are fast and efficient to read, write, and comment on blogs. Just to give a sense of the time scale we are talking about, each of my posts on DrugMonkey takes an average of about ten minutes to write. Each of my posts on PhysioProf takes an average of about five minutes to write. This comment took me less than one minute to write. j.o. : you imply that FSP uses her blog for mere whining and venting. This is not at all what I see her doing. She raises important concerns about the academic world, and she attempts to diagnose them and find solutions. This is an invaluable service to all of us, which is why she has so many faithful readers. We wouldn't read her blog if it merely consisted of whining. But even if it did only consist of whining, it's her own dang business! As long as she's meeting her responsibilities to others in her work and personal life, it's nobody's business what she does with her time! j.o. 's name is apt since what I read was little more than the offal of mental masturbation. Blogging is a hobby. People are allowed to have hobbies (even scientists). Having a hobby does not mean "work" gets neglected; in fact, research suggests that taking time away from "work" is rejuvenating and makes work more productive. In FSP's case, blogging probably should count as "service," but we all know that's not going to happen any time soon in academia. When I was teaching, I knew one guy who could crank out a page of really elegant prose quicker then I could get my pencil sharpened. (These were the days before word-processors.) I did envy him this facility. The fact that he was a complete fool only made my envy more envious. I suspect that you are one of those people who can just sit down and let the words flow. I am not. I do envy you this talent and I do not think you are a jerk. I read this blog because I, a white male, agree with most of the issues you raise. I just got hit with them and was told to shut up. If I have problems with your blog it is because I could not vent about the fools and mountebanks I had to deal with. That's water under the bridge and over the dam. Maybe you can pick off a few of the assholes I had to deal with but could not get rid of. I vote for "should count as a service" as well... as someone who is just starting grad school - like as in tomorrow morning ACK!!! - this blog - and especially your book - have been very helpful. Blogging is not a time-wasting activity. I am pretty sure those who criticized you spend multiple hours chatting up total strangers in bars on weekly basis! The only thing I'd like to ask; is to increase the scientific content of your blog. It seems you blog exclusively about work environment. Doesn't this include, you know, science? Keep your identity hidden all you want, you may even start a new blog, but would it be more time-wasting if you start including simplified discussions on your scientific research? I am an undergrad in science now and I have found reading this blog to be quite beneficial. Obviously I have not learned anything specific to my field and it doesn't help me do better on my homework or anything, but I feel that reading the blog has made me more aware of possible problems I may encounter as a prospective FSP (waaaay down the road) and FSP has certainly shed some light on what I consider to be very important questions of etiquette in academia (I never would have thought that using animated power points could make members of the audience sick and I will always be aware of that now when I do presentations). I certainly like to think that by continuing the write this blog, FSP has enlightened me on a number of issues about which I, otherwise, would have had to learn the hard way--or worse, been oblivious! Thank you for your insights, FSP! I think your hobby of blogging is actually a wonderful service to those of us who stand to learn from you and your experiences!! This blog absolutely counts as service. You are teaching non-scientists about what scientists actually do, as well as serving as a mentor and a resource to students and early-career scientists, especially women. Both fit NSF's description of an "education activity," which includes "conducting outreach and mentoring activities to enhance scientific literacy or involve students from groups that have been traditionally underrepresented in science." If it were me, I'd be tempted to put it on my vita under "Synergistic Activities"! My priorities are askew and/or I enjoy wallowing in victimhood so much that I will never be a truly successful science professor. Hmm, I was under the impression that you're already a successful science professor, and that part of the point of this blog was that you got to share your experiences as one of the relatively few women who are. Assuming that female and/or minority scientists are failing when they voice legitimate concerns about discrimination and chilly climates is common. Evelyn Fox Keller got the same thing and has written about it in "The Anomaly of a Woman in Physics". I vote no to blogging about specific science. That way, I can still pretend that on some off chance, FSP is a professor in Inorganic Chemistry. This isn't likely since she does her own research from time to time, but possible. In fact, if she started to blog about particulars, I'd find out she was in some physics field and some part of my identification with this blog would die. tw andrews: yes, commenters like that are a bit slow. Hence, them showing up on threads that make fun of them and continuing to press their point. These kind of people are "not playing with a full deck", so to say. I doubt a person like that would ever make it into the Academy. Your blog should totally qualify as "service" or even as time spent advising. You are my secret advisor and you don't even have to sign any paperwork. I'd give a lot for a universally accepted "sarcastic font", btw. In my field, no hobbies are acceptable, unless you are a man with children, in which case picking up your kids from daycare is occasionally OK.
My advisor travels constantly for work, and so far as I can tell, does nothing except work and sleep. I've rarely seen evidence that there is time to eat as a professor. You have time to watch tv but you don't have time to respond to my emails, you #$%@-er! I haven't heard any other pop culture references since then. Hmph. I'm writing another comment, having read the rest of these. FSP, I get these "anti-women's blogs" comments a lot. b) stopped feeding the beast by giving these people airtime on my blog. My policy of late has been that if people are writing comments and not adding anything new that I haven't heard before, and it's negative or nasty, I just delete it. I no longer feel the need to document every instance of abuse I experience from blog commenters. Lord knows there's not enough privacy in blogging to document every instance of abuse I experience in the real world. I really love your blog, and I think these naysayers are the same old crowd who think there is no sexism, etc. I got in one of these conversations with a semi-old boy at a party over the weekend. He was saying sexism is not that bad anymore, at least in some fields. I told him he was wrong, gave him an earful, and he shut up, at least for the time being. What can we do but try to publicize the problem and come up with ways to fix it. But some people are never going to listen until it's their sister, daughter, girlfriend or wife going through it and they are powerless to help. Then maybe they'll understand a fraction of what it's like for us. I would really *love* to see one of those giant squid poems. FSP your blog is invaluable. There are enough science news blogs out there. What you write about is insider experience as it relates to being in a unique and fairly uncommon position which is being a woman in a male dominated field which also happens to be academia (which is a whole weird world all its own). Those who have a problem with the content and direction of your blog can feel free to skip over to something more to their liking. The fact that they choose not to do that and instead spend THEIR time whining on your blog, speaks more about them than about your blog. Ignore those losers and keep up the good work.